The laptop you lug to the café, the 4K TV on the wall of your den, the chargers for the numerous devices you probably own, and a growing list of other electrical products all have one thing in common: They run on direct current (DC). But, of course, the grid system that feeds electric power into our homes and businesses runs on alternating current (AC). That’s why the plugs for so many devices have DC converters on them—converters that waste energy. “Doing it that way makes little sense,” argues Gregory Reed, a professor of electrical and computer engineering at the University of Pittsburgh. Some 124 years after AC power ended up winning the War of Currents as the operational current for the electric grid (see sidebar on this page), there is now a push to enhance and update the grid with DC—a type of electricity that proponents say is more in sync with the devices it will power as well as with America’s growing use of newer sources of power, including renewable energy and batteries. The push toward DC is being waged on two fronts: the increasing use of high-voltage direct current (HVDC) lines for long-distance transmission of power, and at the grassroots level in the creation of DC microgrids. 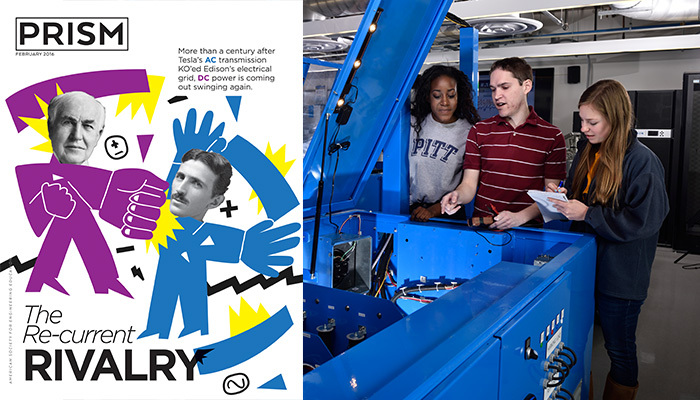 At the forefront of this power revolution in the United States is Pitt, which has in recent years carved out a big role for itself in the development of a DC grid, an area that has so far not attracted much interest from academic researchers. “We are not the only ones out there, but we are taking a lead among academics,” says Reed, who heads Pitt’s Center for Energy and the Electric Power Systems Lab. “It is a niche we’ve focused on.” He’s confident that Pitt will become the de facto benchmark school for DC research developments. Florida International University, North Carolina State, and Virginia Tech are among the handful of other schools that are already active in developing DC power. “It is, however, a growing space,” Reed says. And he suspects that growth will likely pick up steam if, as expected, the U.S. Department of Energy soon starts to fund more DC research. Because there’s not been much DOE funding, Pitt has so far relied mainly on industrial and foundation money to support its direct-current research. For example, the Henry L. Hillman Foundation gave the school two grants last year, one totaling $400,000, the other $2.5 million. And the school has worked with most of the main industrial players, including Siemens, Mitsubishi Electric, ABB, and Eaton. Pitt researchers have moved in recent years from mainly modeling and simulating electrical networks to building and testing prototypes of next-generation power converters. This year it will begin operation of a new high-voltage Electric Power Technologies Laboratory. Alternating current—an oscillating type of electricity in which the electrons regularly, rapidly change direction—became the grid’s power source mainly because back in the late 19th century AC was cheaper and easier to distribute long distances with fewer power plants needed than DC, a type of power in which the electrons travel in one direction in a steady stream. That was largely thanks to the invention of the AC transformer by engineer and entrepreneur George Westinghouse. This mechanical device was able to increase the voltage of generated power to high levels for less costly transmissions, and then step it down to lower levels for local distribution and to power low-voltage devices and machines. Thomas Edison was a champion of direct current—he railed that AC was dangerous—and built his utility around it to provide low-voltage power for residential and business users. But the need to send power long distances using high voltages very quickly undermined Edison’s business model. Today, the case for AC is much weaker. Power electronics is the use of solid-state electronics to control and convert currents. First developed in the 1970s, it has given DC the edge, proponents say. AC’s complex, three-phase frequencies are harder to control compared with power electronics-controlled DC. And it’s now easy to convert AC to DC and vice versa because of the development of thyristors—a type of power-electronic switch that’s basically a semiconductor. The main application of DC has been HVDC transmission networks. According to Visiongain, a British market research firm, the worldwide HVDC transmission market will hit $30 billion this year, led by big projects in Asia, particularly China. For example, Switzerland’s ABB last fall won a a $300 million contract to supply technologies in the building of two 800-kilovolt links that will transmit 8 gigawatts of wind and solar power from Shanxai to Nanjing and from Jiuguan to Hunan. By 2020, it’s expected that China will have around 40 HVDC lines in operation carrying 270 gigawatts of capacity. Europe is also a leader in HVDC transmissions. Denmark, for instance, gets half of its power from offshore wind turbines linked to the mainland by HVDC lines. In Canada, a $3.5 billion, 218-mile line carrying 500 kilovolts between Edmonton and Calgary began operating last December, and in the United States around 20 HVDC projects are in the planning stages. In the long term, there are huge savings from transmitting electricity over HVDC lines because power losses are only around 6 percent to 8 percent, compared with losses on AC links—which carry the power on the outside of the lines—of 12 percent to 25 percent. And capacity on DC lines is five to six times greater. While transmission lines in China are ramping up to 8 gigawatts, the top end for AC is around 1.5 gigawatts. Short term, DC lines are cheaper to build, too. Because AC is a three-phase form of power, it needs three cables to handle it, plus two more for lightning protection, for a total of five. The same amount of power carried using two-phase DC needs only two wires, plus one for lightning protection thus requiring much less infrastructure. DC transmission wires also cost less, which is why they also make more sense for underground and underwater lines. The biggest cost for HVDC transmissions, Reed says, is the conversion stations at either end, which can be expensive. Nevertheless, a 2014 Australian study determined that despite the high cost of conversion equipment, because of lower capital costs and power losses, overall HVDC lines were cheaper than AC lines. The conversion stations are necessary because, with the exception of solar power, which is naturally produced as DC, all other power sources are still AC—even other renewables, like wind. But renewables tend to be located far from where they’ll be used—the prairies of Nebraska, for instance—so the low construction costs and reduced energy losses make HVDC the better option for carrying power from wind farms to urban areas. And because DC lines are more controllable, wind power can also be shunted more easily to where it’s most needed. There are still some technical issues to overcome to make HVDC truly efficient—better circuit breakers, for one. AC grids have mechanical circuit breakers, so if part of a grid develops a problem, that portion can be disconnected while the rest of the network keeps working. ABB in 2012 developed a hybrid circuit breaker for DC lines that combines mechanical and power electronics switching. But despite advances like that, Reed says, “we are still looking for the next-generation circuit breaker.” And DC-to-DC transformers that can step power down or up between high-voltage transmission lines and low-voltage local distribution lines are still very much a work in progress. Meanwhile, the growth of microgrids—localized electric grids that can operate in tandem with a bulk grid but detach themselves and run autonomously when conditions warrant—are increasingly seen as a way to bring DC into greater use from the ground up. A central grid network that’s linked to numerous microgrids is a way to protect against widespread outages caused by weather or equipment malfunctions. Most microgrids run on renewable power, particularly photovoltaics. “In a PV system you can use it directly on the fly, as it’s generated in daylight,” says FIU’s Mohammed. “If you eliminate the need to convert from AC to DC, that’s higher efficiency.” And the excess power the solar cells create is typically stored in batteries, which are also DC. But Aalborg’s Guerrero says that “there is a need for better battery storage systems,” which is why he is intrigued by electric vehicle maker Tesla Motors’ move last year into the market for home battery packs to store excess solar power. But DC is also increasingly seen as a better option for all types of microgrids, both residential and business—again because so many devices and appliances run on DC. The review of DC research that Mohammed co-authored noted that even big industrial operations are ever more reliant on direct current: The steel industry is using more DC electric arc furnaces because they’re more efficient, and the electrochemical industry is almost entirely reliant on DC. “The driving factor,” Reed says, “is that more and more of our end-use devices run on DC power.” And as transmission and distribution networks increasingly turn to DC to accommodate that trend, somewhere Thomas Edison is smiling. A high-voltage rivalry between the luminaries of the electrical age gave rise to today’s AC power grids. The history of America’s electric grid is literally strewn with dead bodies. Dogs, horses, a convicted murderer, and a circus elephant named Topsy were all publicly electrified using alternating current (AC) power in publicity stunts concocted by Thomas Edison. The inventor’s high-volt executions were a desperate—and ultimately unsuccessful—attempt to derail AC in favor of direct current (DC) in what became known as the War of Currents. By the late 19th century, Edison already had launched an electric utility based on DC to bring low-voltage power into homes, offices, and factories. Direct current had a major flaw, however: Generators could reliably deliver electricity only within a 1-mile radius, and thus would require many, many power stations to work. Along came Nikola Tesla, a Serbian engineer who ended up working for Edison. Tesla championed AC, a form of electricity that Edison called “impractical” and more dangerous than DC, which remained low-voltage from generator to consumer. Edison and Tesla were as mismatched as the Odd Couple. Self-taught Edison was wedded to trial-and-error experimentation. He also was a slob. Classically trained Tesla was a hygiene freak who preferred working on theories to trying prototypes. When Tesla finally quit in 1885, it was because Edison cheated him out of a promised large sum of money. Tesla worked odd jobs, including ditch-digging, to save start-up capital for his Tesla Electric Light Company, where he developed and patented a number of AC components, including generators and motors. His work caught the eye of another inventor, George Westinghouse, who had become successful on the back of several patents, most notably compressed-air brakes for trains. Westinghouse bought Tesla’s inventions and brought him onto a team of engineers that included William Stanley. Stanley, working on concepts that originated in Europe, designed and built the first reliable commercial AC transformer. That was the key to high-voltage long-distance transmission, yet lower-voltage local distribution. Realizing he now faced a real threat, Edison launched the current war, and he was ruthless. He organized literal dog-and-pony shows around the country where Harold Brown, a professor of electrical engineering, would use AC to electrocute dogs and horses on stage to show how dangerous alternating current was. Brown was also behind America’s first electric-chair execution—again using AC. It didn’t go well. Convicted ax-murderer William Kemmler didn’t die after the first whack of power convulsed his body, and it took several long minutes to rebuild the current to give him a second lethal jolt. Witnesses were horrified. Ultimately, Westinghouse and Tesla proved to be better—and certainly less murderous—showmen. Their system was used to light the Chicago World’s Fair in 1893. The so-called City of Light they created was a dazzling display of AC’s potential. Even though Edison continued his AC smear campaign for more than a decade, executing a rogue circus elephant in 1903, the War of Currents was effectively over—and Tesla won.